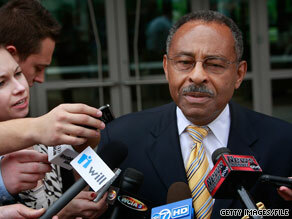 Illinois Democrat Sen. Roland Burris is expected to announce Friday that he will not run in 2010. WASHINGTON (CNN) - Sen. Roland Burris, D-Illinois, is expected to announce Friday that he will not run for a full six year term next year, a well-placed Democratic source tells CNN. Burris is currently serving the remaining two years of President Obama’s Senate term, but he has never been embraced by Democratic leaders in Illinois or Capitol Hill. A Burris spokeswoman would not comment on the senator’s future political plans, but his office did release an advisory Thursday stating that he would make a “major announcement” during a speech Friday afternoon in Chicago. A spokesman for Senate Majority Whip Richard Durbin, D-Illinois, said that Burris had spoken to Durbin but would only say “we will let him speak for himself” on Friday. Burris was appointed to the seat in late December by then-Gov. Rod Blagojevich, who had been arrested on federal corruption charges for allegedly trying to sell Obama’s seat to the highest bidder. Democratic Party leaders urged Blagojevich not to make an appointment, but he disregarded those wishes by naming Burris, a former state attorney general and state comptroller, to the seat. Blagojevich was impeached and removed from office in January and Democrats grudgingly recognized Burris as the junior senator from Illinois. But he still faced an investigation and scrutiny at the same time he was trying to learn the ropes on Capitol Hill. In June, the state attorney in Sangamon County ruled that it would not charge Burris with perjury in connection with his testimony for the alleged “pay for play” scheme with Blagojevich to fill the Senate seat. John Schmidt, the state’s attorney, said that Burris gave incomplete but truthful answers to questions about his conversations with Balogjevich’s representatives. Without the backing of national and state Democrats, it would be a difficult, if not impossible, campaign for Burris to run for his own six year term. Now, the question is who will run for Burris’ seat? A top candidate for the nomination, state Attorney Gen. Lisa Madigan, announced earlier this week that she would run for reelection of her current office. Other Democrats reportedly eyeing the seat include Illinois Treasurer Alexi Giannoulias, Chicago Urban League President Cheryle Jackson, and Chicago businessman Christopher Kennedy. Kennedy is the son of the late Sen. Robert F. Kennedy, D-New York. A senior Senate Republican source tells CNN that Rep. Mark Kirk has told GOP leaders that he plans to run for the seat. A Kirk spokesman could not be reached for comment Thursday evening. - CNN’s Paul Steinhauser and Evan Glass contributed to this report. Smart move. Almost useless even trying to run for that seat with a dark cloud hanging over his head. Roland Burris is a low down Chicago criminal cut from the same cloth as Barack Obama. Neither of these so-called men have the desire to serve anyone but themselves. Sen Burris, Ride into the Sun and write a book, "Sen. Burris – The Mavrick"